I remember very distinctly how much derision flew at this film when it first released. Middle school boys are a really tough sell on any horror movie that fails to appeal to their more basic fixations, but even going by adjusted standards the universal consensus was "don't watch, it's a waste of your time." I don't often say this, but the two morons who sat behind me in geometry were totally correct. This might be the most 2003 movie I've ever seen, right down to the nu-metal. Brief, but pointless. It just wants to be too much at once. 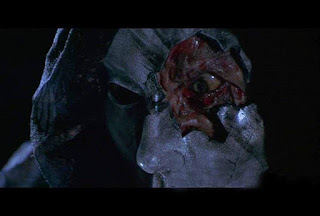 This horror monster's origin is all at once a dark re-imagining of the Tooth Fairy lore, a stock New England witch origin left over from a discarded Blair Witch Project sequel, and also a small-town horror version of Pitch Black's literal light vs. darkness concept. The actual plot of the movie is delayed by almost twenty minutes, when the entire film is only eighty-five minutes long. No, stop. Scratch that. This movie is seventy-five minutes long, with ten minutes of end credits. Did we need both the stock footage history lesson prologue and the cold open prologue with the first scare? And did that cold open need to last over ten minutes? At that point, your prologue is close to eating up a third of the entire movie! Reasoning for this becomes clear when you reach the hour mark, the plot is finally in full swing, and you realize you're already at the big final conflict with the monster and there's only fifteen minutes left. Pacing issues aren't present because of ineptitude, they are present to cover the lack of a feature-length plot. It's really weird, especially since most of the Tooth Fairy narrative is abandoned completely after the monster's initial motive is established. Teeth don't play a large part in anything, the secret to killing the beast is not divined from her wrathful search for teeth or revenge, and she is never referred to as the Tooth Fairy again. Almost like this was two different horror movies grafted onto each other. This is also a real goldfish-brain movie. Every scene has to call back to the scene immediately before it, as if the plot would float away if we weren't reminded directly of a line of dialogue from two minutes ago. Protagonist Kyle's first scene with dialogue features his mother asking about his plans to ask a girl to the school dance. Next scene, said girl sneaks into his room and...he asks her to the dance.Though twelve years and a lifetime of trauma and unspoken regret passes, our two leads have their first adult conversation over the phone and still feel it necessary to talk about that G-D dance that they never attended from seventh grade. Thanks, movie! I think I'm following your labyrinthine saga. Every supporting character is introduced just in time to be summarily carried off or mauled to death in the very next scene, too. It's a shabby work of setup and payoff, especially in a movie where the plot proper practically takes place in real-time, covering only a few hours of events with no time for rising action at all. The design of the Mathilda/Tooth Fairy creature is very flat and uninspired, a porcelain mask and hood that could stand in for just about anything. Later on, in her final incarnation, she's essentially a gooey Freddy Kruger witch, and that is evidently the design that necessitated the Stan Winston workshop. When that fails to inspire any fear, the editing team went to work, making her every appearance a series of swooping pans and jump-cuts, along with a strobe light effect so we can't get too clear a view. I sympathize with Director Jonathan Liebesman and DP Dan Laustsen. When Ridley Scott made Alien, similar problems existed. Ever watch that deleted scene where the xenomorph crab-walks, and you can actually see how rudimentary the suit was and how plainly the creature is being played by a wiry dude with a lot of foam rubber? Yeah, so I get it. But if literally every appearance of your creature has to have a cheat to make it work...perhaps your creature design is a bit crap, yes? There are scenes that, on paper, could totally work if the creature was as creative and inherently terrifying as the plot purports it to be. Kyle watching in horror as the Tooth Fairy zooms around a darkened police station bullpen, tossing deputies to and fro and screeching like a wild beast could have been a real dolly-zooming, off-the-rails sequence. The car attack that sees poor Larry carried off like a field mouse by the world's largest screech owl could have had a great surreal, inhuman quality to it, but nope. These scenes fail thanks to the fleeting cover-up maneuvers and the inevitable lack of visibility from a film that--by necessity of the script's plot--has to mostly take place in pitch blackness. Instead, a lot of the scares of the film rely heavily on the generic audio mix of eerie old woman moans, piercing animal screeches, and slobbery monster roars. That wears out its welcome within the first scene. The cast also fails to sell the scares. Kyle is one of those horror movie characters who everyone assumes murdered a loved one many years ago, and yet he's walking around free, living his life as a functional paranoid obsessive. This type of character only exists in horror movies, because obviously there's no such thing as a functional paranoid obsessive in reality. Chaney Kley is a real Johnny Actor-Face in the role, hitting his marks and saying his lines with just enough conviction without letting any genuine personality into the stock role. Not that he has any real material to gnaw on. No one really gets a character here, because we're in such a hurry to blaze through any Act II development. Lee Cormie, cursed with the post-Sixth Sense "little boy seeing impossible horrors" role, is doing everything a kid actor can when saddled with dialogue no human being has ever naturally spoken. He's still pretty awful, using a precocious toddler drawl a few years too late. I can pretty easily find things to like in a horror film, even a bad one. Darkness Falls has a few surface details that prove to me that someone was trying to be creative, even inside the little box they were corralled in. The notion that a town would be called Darkness Falls outside of being the setting for a horror film is kind of undeniably fun. Almost brazen. I think the concept that Kyle ended up growing up in Las Vegas, where the lights never go out, is cute, as is his hoarding of various flashlights. That bit doesn't make a ton of sense, of course, but it's more visually interesting to see him loading up a duffel bag of flashlights than to merely have one good one and a big pile of batteries. And without fail, the movie's logic operates off a vaudeville comedian's sense of timing, with dead-meat victim characters carried off screaming to their doom the moment they stray from the instruction to "stay in the light," or immediately after saying something prophetic like "We're safe here." Things like this nudge the movie toward "good-bad" horror, which honestly would fit the whole Tooth Fairy nonsense just fine. But other than that, there's nothing to distinguish it. It's not interesting in its badness, just so depressingly by-the-numbers. We get a false scare from a cat, mirror scares, the town sheriff with a huge chip on his shoulder, lots of prejudice for behavioral meds and therapy...if this movie were exactly the same, but made in 1985, I'd accuse it of being tired. As a 2003 feature, it's recycled garbage. Its greatest ambition is to merely function as a feature-length film, and it barely qualifies for that.